The Oconee County Board of Commissioners on Tuesday night will vote for the second time in as many months on a rezone request that is linked to a roadway that does not exist. The county’s legal advisors have recommended approval of the rezone on Tuesday night for property just east of a blind curve on Daniells Bridge Road as part of a settlement in which the county would obtain one acre of land for a proposed roadway that the county has said is at least 10 years from completion. The blind curve on Daniells Bridge Road was created when the on-ramp from SR 316 East to SR Loop 10 was built. The curve is particularly dangerous because drivers traveling east on Daniells Bridge Road can easily get the impression they need to bear left in the direction of Loop 10, but they actually need to turn right to stay on Daniells Bridge Road. The curve is at a high point of roadway, meaning that drivers in either direction are looking at the sky rather than at the roadway. The speed limit is 45 miles per hour. Stephen D. Jenkins and Edward Nichols of Athens propose to build a two-story office business park on a nine-acre site just east of the curve. The business park will have two exits onto Daniells Bridge Road, one at Will Usher Road about 450 feet from the curve. Commissioner Jim Luke confirmed to me in a conversation on Oct. 21 that the county has been advised to approve the rezone as part of a settlement of a suit that was filed by land owners Dorothy N. Anglin and Dolores N. Lance of 340 Ashton Drive in Athens after the BOC turned down the rezone request on May 1, 2007. The county is concerned that if it does not settle the suit, Luke said, the Oconee County Superior Court will grant the rezone without any conditions. At present, the Oconee County Planning Staff has recommended eight conditions, including that Anglin and Lance give the county ownership of one of the nine acres for the right of way of the future road. On Oct. 7, 2008, attorney Michael Pruett, representing the county, filed a consent order with the Superior Court stipulating that Anglin and Lance had agreed to meet the conditions if the BOC approves the rezone. Jeffrey DeLoach, representing Anglin and Lance, told the Planning Commission on Oct. 20 that Judge David Sweat had signed the consent order on Oct. 14. The Planning Commission voted 5-1 to send the rezone request forward to the BOC without recommendation. The BOC frequently goes into closed session to discuss legal matters with County Attorney Daniel Haygood, who practices law in partnership with Pruett in Watkinsville. The county never provides an agenda for those meetings or any record of what was discussed. Pruett is unlikely to have filed the consent order if the members of the BOC had indicated in the closed discussions that they did not wish to settle the case. On Oct. 7 the BOC approved a rezone for Epps Bridge Centre on 68 acres across the intersection of SR 316 and SR Loop 10 from the proposed office park on Daniells Bridge Road even though the primary access road to that development has not been built. The state is expected to let the contract later this year, though the date has been pushed back several times already. That unbuilt road is called at present the Oconee Connector Extension, and it will run from the current Oconee Connector intersection with SR 316 west of SR Loop 10, fly over SR Loop 10, and connect back to Epps Bridge Parkway east of SR Loop 10. The county proposes to extend the existing Jennings Mill Parkway that serves as the entrance to Home Depot so that the extended roadway crosses SR Loop 10 south of Home Depot. The new roadway would be called the Daniells Bridge Extension and would connect with the existing Daniells Bridge road just west of Chestnut Hill Road. At the May 1, 2007, BOC meeting, then Public Works Director Mike Leonas, said construction of this roadway was at least 10 years away. That was before the current financial crisis that has resulted in the cancellation of many state roadway projects, including the widening of Mars Hill Road from SR 316 to Watkinsville in Oconee County. Even if the Daniells Bridge Extension were built, however, it would not fix the blind curve on Daniells Bridge Road just west of the proposed office park. The county has discussed improving Daniells Bridge Road from Founders Boulevard to Mars Hill Road but not east from Founders Boulevard to the proposed rezone site, at which the proposed Daniells Bridge Extension is to end. GCA of Atlanta conducted a Traffic Impact Analysis for Nichols Land Development Company and submitted its report in March of 2007. According to that report, the proposed office park will have 394 parking spaces and exits onto Daniells Bridge Road at Will Usher Drive and 520 feet east of Will Usher Drive. 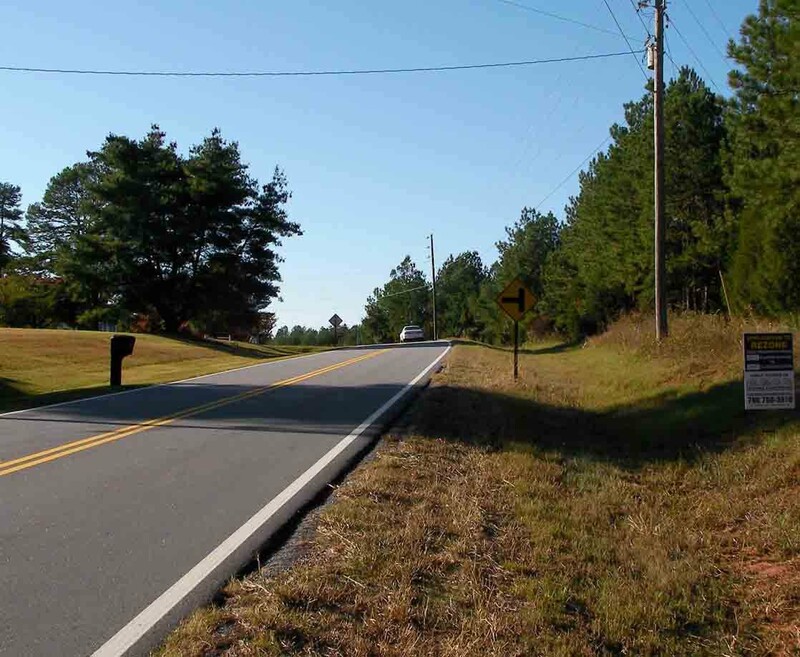 According to the report, the study focused on the impact of the new development on Daniells Bridge Road at these two exits and entrances, at the Daniells Bridge Road intersection with Founders Boulevard, at the Daniells Bridge Road intersection with the Oconee Connector, and at the intersection of the Oconee Connector and State Route 316. The traffic study makes no reference to the blind curve on Daniells Bridge Road just west of the site, essentially treating Daniells Bridge Road as if it were straight. The analysis was performed "to evaluate each of the three intersections with respect to the current volumes and the additional traffic from the development." Based on a "Trip Generation Manual," GCA estimated that an office park of the size of the one proposed will generate 1,458 average daily trips, including 206 in the morning peak and 206 in the evening peak. "After consultation with Oconee County staff, it was decided that" 90 percent of the traffic coming out of the Anglin and Lance site would turn right, heading toward the Oconee Connector, and the remaining 10 percent would turn left, heading east on Daniells Bridge Road in the direction of Hog Mountain Road. CGA estimated that half of the traffic would use the western most exit, and half would use the eastern most exit. CGA concluded that Level of Service (LOS) will deteriorate at all three of the intersections as a result of the proposed project, but only at Daniells Bridge Road and Oconee Connector and Oconee Connector and SR 316 is the deterioration expected to be significant. CGA said the deterioration at these latter two intersections would occur even if the development did not take place and recommended improvements to those sites. The LOS would be "undesirable" without those upgrades, CGA wrote. Of course, continued congestion at these two exits could encourage more drivers to turn left coming out of the proposed office park, putting more traffic on Daniells Bridge Road heading east. A left-turn exit is necessarily more dangerous than a right-turn exit since it requires the driver to cross traffic. The CGA report said the LOS at the project driveways would remain at the top level, though it did not indicate how much deterioration would take place from the existing LOS. The Oconee planning staff concluded that the advantage of not granting the rezone would be "less traffic and road maintenance and less demand for law enforcement and fire suppression activities, emergency services, and other county services." The existing roadway has no paved berms or sidewalks. Four driveways enter Daniells Bridge Road, in addition to Lynn Drive and Will Usher Drive, in the short distance of the proposed development. In addition, overhead power lines cross from the Anglin and Lance property, back to the opposite side of Daniells Bridge Road, and back to the Anglin and Lance property. 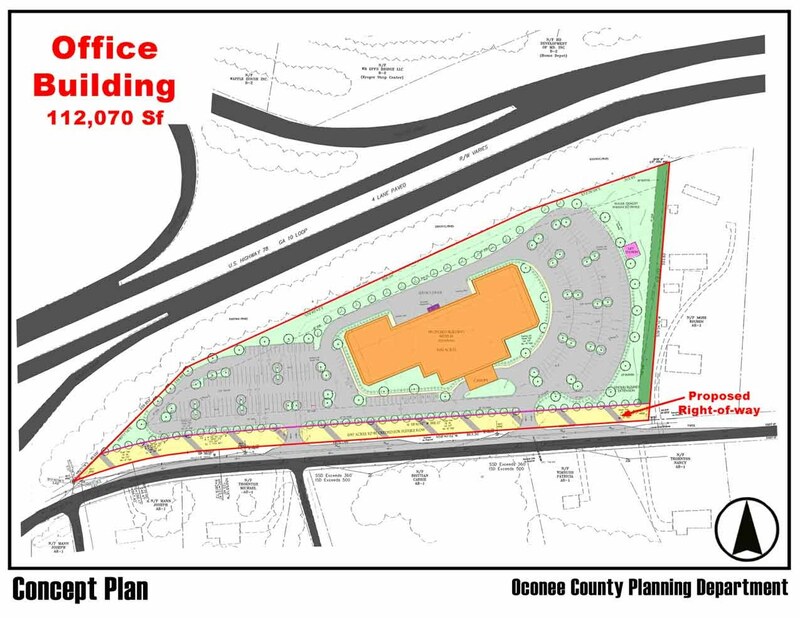 The Oconee County planning staff has stipulated as one of its eight conditions that the developer install center turn lanes and acceleration and deceleration lanes at each entrance and exit. The center turn lane would start in the blind curve, meaning that backed up traffic coming fromthe west and turning left into the proposed office business park would make it even more difficult for drivers wishing to turn left from that park onto Daniells Bridge Road to see traffic coming out of the blind curve. The two-story building will have a footprint of approximately 56,000 square feet. According to a drawing submitted by Beall and Company on behalf of the developer, about 55 percent of the surface area would be impervious surface, but the 45 percent designed as landscaped includes the acre set aside for future highway right of way. With that acre removed, more than 60 percent of the surface area that is currently wooded would be impervious surface. To accommodate stormwater runoff, the developer proposes to create underground detention facilities. The developer also proposes to include a lift station to pump sewage from the site to the county’s main lines. In May of 2007, neighbors turned in petitions with more than 400 signatures in opposition to the rezone. The Welbrook Farms Home Owners Associations voted to oppose the development, and citizens from neighboring subdivisions spoke against it at the public hearing. I helped organize the petition drive and was head of the Welbrook Farms HOA at the time. I also spoke at the hearing. Commission Don Norris recused himself at that meeting because of an unspecified conflict of interest. Commissioners Luke, Margaret Hale and Chuck Horton voted to turn it down. Anglin and Lance are seeking to rezone the land from Agricultural-Residential to Office Business Park. The OBP category allows for a variety of business applications. It does not include restaurants, though the county has designated the area as "wet" in the beer and wine ordinance it passed earlier this year. The public hearing on Tuesday–election night--will start at 7 p.m. in the courthouse in Watkinsville. Polling stations throughout the county and state close at that same time. That the county would agree as part of the consent order to a public hearing on election night starting as polling stations are closing says a lot about the county’s approach to the hearing. Click here to take a drive along Daniells Bridge Road at the proposed development site. Cick here to see what a driver exiting the site looking to the blind curve will see.